Walmart is pushing back against labor groups by providing managers with talking points to discourage workers from joining up, internal documents reveal. 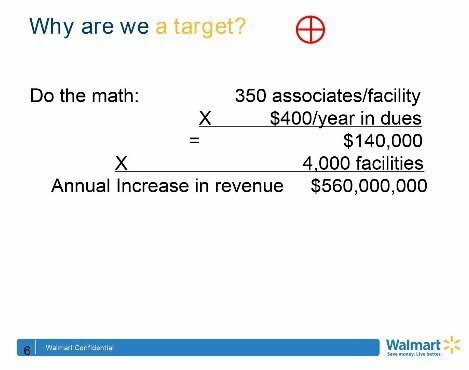 Internet activist group Anonymous leaked a set of Walmart PowerPoints instructing managers to remind workers that union-backed groups like OURWalmart aren’t trying to help them -- they’re just looking to take their money. Kory Lundberg, a Walmart spokesman, confirmed the documents are Walmart's and said they've been around for a while. "We know the unions have provided bad information to associates in the past, and that’s why we think communications like those are important," he said. "We think it's important to communicate timely and accurately to associates on this topic." Walmart has been battling labor groups in the court of public opinion for the past few years. 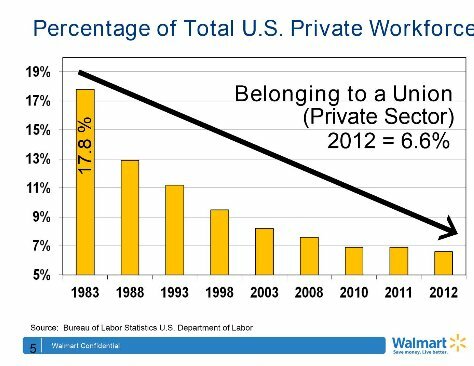 One of the main targets of the PowerPoints, OURWalmart, is backed by the United Commercial Food Workers union and has played a large role in organizing Walmart workers and other activists. The actions, including protests outside hundreds of Walmarts on Black Friday, aim to call attention to what demonstrators describe as Walmart's low pay and poor working conditions. 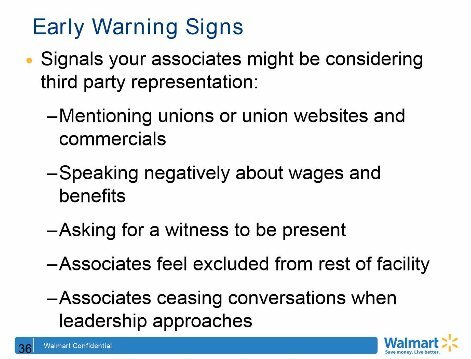 While the PowerPoint takes pains to instruct managers not to threaten, interrogate or spy on workers interested in organizing, it offers managers tips on how to tell whether their workers might be at risk of joining up. 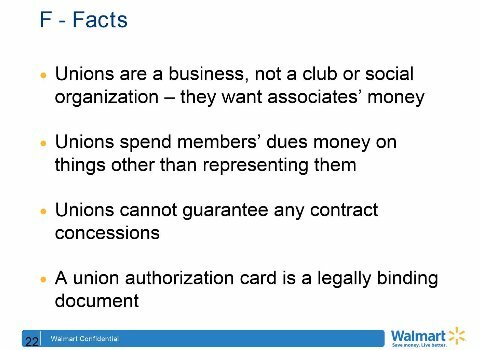 The PowerPoint also provides managers with very specific instructions on how to legally discourage workers from organizing. It’s not uncommon for employers to encourage these anti-union “educational sessions.” Activists have accused fast food giants and others of discouraging employees from organizing. 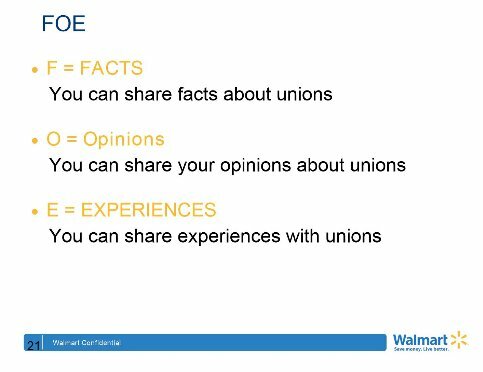 These actions may be part of the reason why unionization has declined in the U.S. over the past few decades, a phenomenon Walmart officials use in the PowerPoint to further their argument. 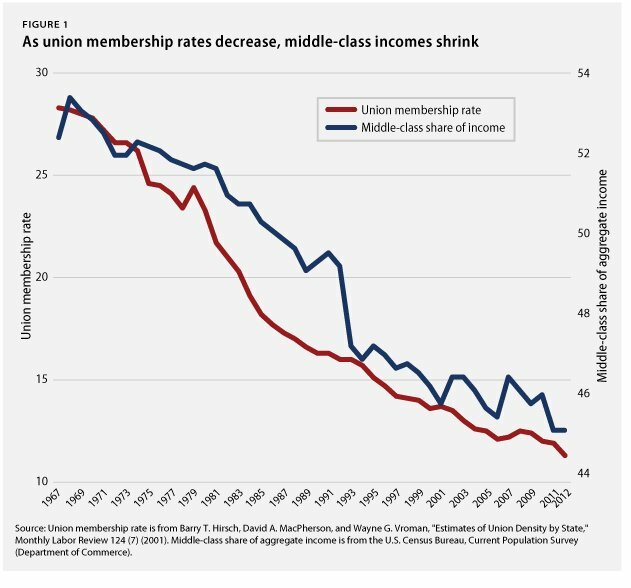 This decline in unionization has also mirrored a decline in the number of middle-class households in the U.S. over the same period. 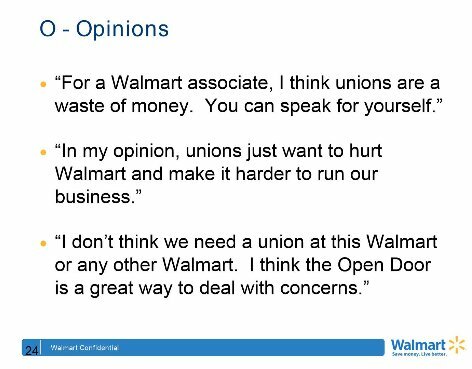 The correlation is a fact that activists haven’t been shy about highlighting -- if Walmart and other low-wage workers don’t have the right to organize, they’ll never escape the bottom-barrel pay or tense work environment that makes them nervous to speak up, activists say.